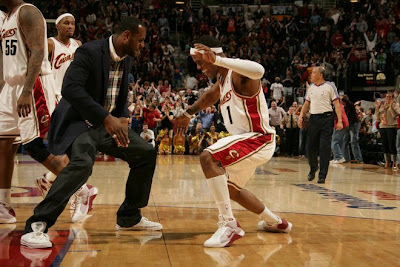 The Converse Blog: LeBron James in Converse! I didn't get around to doing a Friday Flashback post yesterday. By the time I got home from school I was having a busting headache that I needed to stop so that I could enjoy the Alan Jackson concert I was going to later. With a heavy dose of meds and some head-on I was able to enjoy the concert without much discomfort, except from the lady that kept screaming as loud as she could right next to me. Needless to say, I was taking it easy after a long day of dealing with 5th graders. You know else was taking it easy the other day? Yes you do, you clicked on this page and saw the title of today's post. LeBron James was taking it easy and for the first time ever I actually enjoyed seeing him on TV. Why? Well it is because for the first time he wore Converse while on an NBA court, a pair of Chucks. 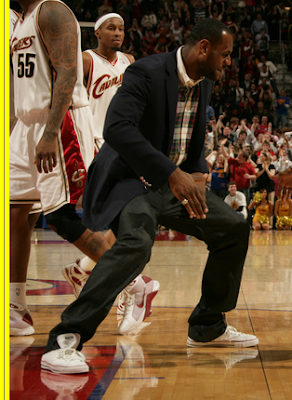 By doing so LeBron added himself to an impressive list of NBA players seen wearing Converse off the court. This list includes, but is not limited to, Steve Nash, Amare Stoudemire, Danny Granger, Kevin Durant, and Derrick Rose. I tried to make the pictures bigger, but I couldn't make it happen without them getting more blurry. Oh well enjoy the Playoffs this weekend, I really want the Bulls, Pistons, Spurs, Blazers, Magic, Heat, Jazz, and Hornets to advance, good thing those aren't actually my predictions.